Originally Trevor was to ride back to Charleston Illinois with us so he could spend some time after the game with friends. While at Bowling Green State University he met several people from Michigan and became friends with some people that are from the Mount Pleasant Michigan area. However, for whatever reasons they could not get together, so Trevor rode back with the team. Usually it takes a very good reason for a player to not ride with the team, so it was probably for the best that he was unable to meet with his friends. We got back to the RV after midnight and had a short night as we were ready to hit the road shortly after nine eastern time. We had done some packing before we left for the game so we only had to eat our Cheerios, hook up the jeep, dump tanks, secure some items on the inside and go. Oh and fix some coffee for the drive. Because of the construction on I65, I94, and I80 we choose a route through central Indiana on a two lane US Highway 421. It was a good choice as we made good time. Apparently many truck drivers thought it was a good route as well. There were several trucks on this road and not many cars. When we got far enough south we cut over toward Illinois on a series of two lanes. There was a truck stop shortly before the Indiana-Illinois line where we paid $3.98 for diesel...first time we've paid under $4 in a very long time. Since it was Labor Day Friday we had decided that we would have to spend the night in a parking lot somewhere. Periodically during the summer I had called different places about camping for one night, but because it was Labor Day everyone wanted a three night reservation. On the way up to Central Michigan we scouted a few places where we could spend the night. But because we made such good time through Michigan and on US421 we decided we would fix another pot of coffee and go for it. We drove 498 miles in one day which is a record for me. When I'm driving the RV I usually stop at 300 miles or six hours. I don't normally drive over 65 mph and usually cruise at 60 or 62mph. Today I got in a groove and had no problem driving all day. The sun was shining and there was no wind, I had good company, and the Cubs were on the radio. It was a good day to drive! We did some basic housekeeping Thursday morning in prep for tomorrow's heading back out on the road. We are still vacuuming up sand from the dunes. There was a moment of considerable concern late-morning after we had walked the dogs. Ditka started getting sick, like he was trying to get rid of something in his stomach that wasn't setting well. Suddenly he keeled over and went in to a seizure. We've never seen a dog do that before. Ken got on the ground with him, held him and calmed him. I was about to rush in to the office for directions to a vet's office, when Ditka started coming around. Within about 10 minutes he seemed back to normal. We watched him for the next several hours. While he stayed pretty quiet he seemed fully back to normal. Our best guess is that he got hold of a bug or weed on our walk that was toxic in some way. To insure that things were tranquil in the RV while we were gone to the game we decided to close all the windows and turn on the air conditioning to insure Ditka had a dark quiet resting place in a consistent temperature. We left at 3pm from Cedar Springs and stopped in Mt. Pleasant at the Grand Traverse Pie Company for an early dinner since we were only blocks from the stadium by this time. While this appears to be a chain popular in this part of the country, it was our first time at this cafe style restaurant. We both did their signature homemade pot pies, with mixed reviews. I'm a 'pastry person' and this place does really flaky, homemade crusts. Ken, on the other hand, thought the filling could have been more flavorful. We called the Larson's, #59 James (Pug) Larson's parents, and, sure enough, they had just pulled in to Mt. Pleasant as well. We met them in the parking lot, to inaugurate the 2008 season of tailgating. By game time the weather was in the low 70's. The stadium was about 3/4 full, approximately 15,000 fans. However, the student section was jam packed and very loud - always a good thing to see at a university. They were loud enough, in fact, that Bodie, our quarterback, had to call a time out on that end of the field once, because the audibles couldn't be heard. This was Trevor's first true trial of his 'new shoulder'. 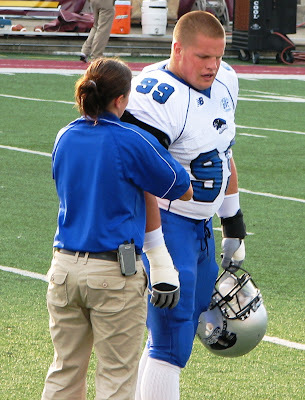 His trainer, Jenn, had him bound up tight, and did some last minute checking and adjustments before Trev took the field. 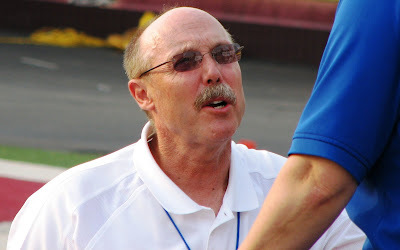 Dr. Karl Rudert volunteers his time with the team. He has been very helpful with us with Trevor's shoulder and we really appreciate the sincere concern he shows for the guys. His wife had joined Karl and the team on this roadtrip and so we enjoyed having her sit with us in the stands. Trevor had been to their farm last year with a couple of his roommates to help put up some hay, a real treat to Trev who loved to spend a day on their farm. We were right on the 50 yard line and close to the boys but, for some reason, the action shots of the game didn't take this time. The game itself was disappointing, a loss 31-12. Trevor's official stats for the game 2 solo and 1 assist tackle, along with one 'BrUp' which apparently means 'breaking up' the play, this was when he did a great volleyball spike of a CMU pass. He also had at least on QB hurry. There was a frightening point in the game when Trev's good bud, Kevin Mahoney, went down and did not get back up. Kevin was the player who came with Trev from Bowling Green, and has visited us many times in Quincy. It became more frightening when they loaded him up in and ambulance on the field and took off, after lots of discussion pointing to base of his neck. 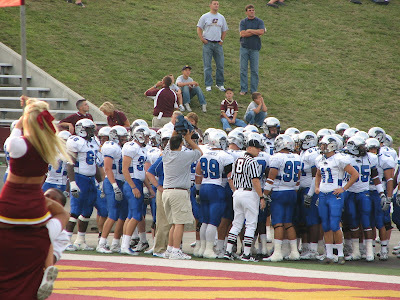 The boys grouped together and knelt for a prayer for Kevin before going back on the field. Ken called Kevin's Dad, Denny, at the end of the game. At that point they were believing it was either just a sprained neck or bulged disk in the neck but were doing CT scans to make sure. At the end of the game, we enjoyed some time with the boys. 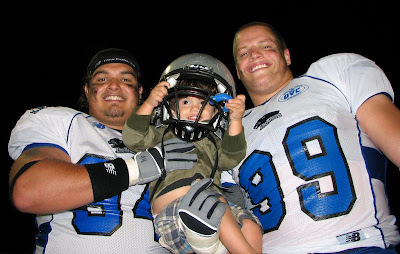 Andre Lima, Trevor's roommate, had his little brother Kevin there, who loves being with the guys. We stopped at McDonalds for bathroom and snack before we did the 60 mile drive back, arriving back at the motorhome after midnight. Ditka was fine. We did a short walk with them and then sacked out for the night, knowing tomorrow will be a long day on the road. With another beautiful evening in the low 60's, Ken slept in Wednesday morning while I did emails and instant messages with work. 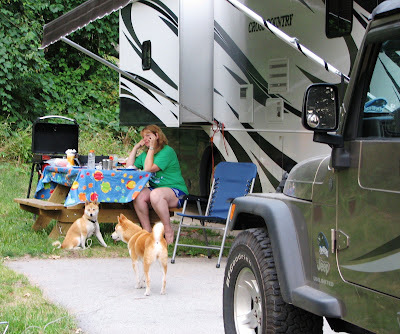 We took our time getting organized for the day, took the dogs for a walk and met more nice neighbors, mostly full-season campers here at Lakeside Camp Park who would be headed down south for their winter roosting in a month or so. 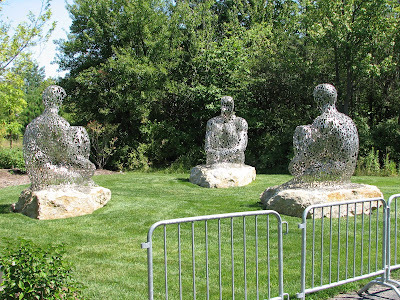 At about 11:00 am, after a late breakfast, we drove back in to Grand Rapids to check out Frederik Meijer Gardens & Sculpture Park. 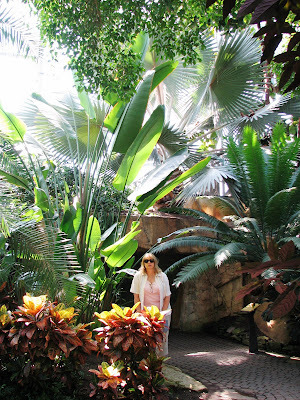 With the temperatures in the 70's and plenty of sunshine strolling the gardens was a relaxing way to spend the day. The highlight of this visit is Da Vinci's horse. 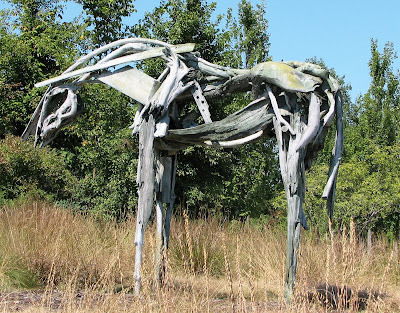 Leonardo Da Vinci created the design for this horse for the city of Milan, but because a war broke out, he lost access to the bronze needed for the sculpture. Now several hundred years later, the Meijer family, of the large Meijer grocery/discount chain, commissioned its completion, using the original Da Vinci designs. Ken had watched a National Geographic special on this which was what originally caught our interest in the gardens. 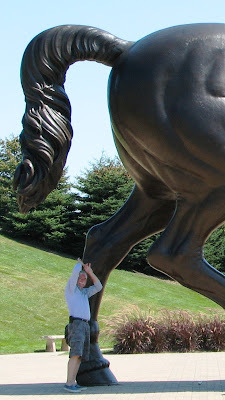 Of course, you can see what Ken is worried about, based on where he chose to stand under this massive beast! 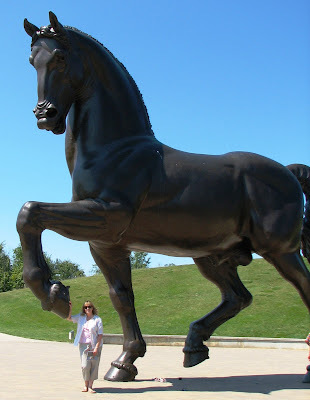 We took a tram ride around the grounds and they showed where nearby there is a sculpture of Mr. and Mrs. Meijer on a park bench looking up at the horse. Mr. Meijer said that since he is sitting there in the park 24 hours a day 7 days a week now he can tell you that the horse does in fact change feet when he thinks no one is watching!! 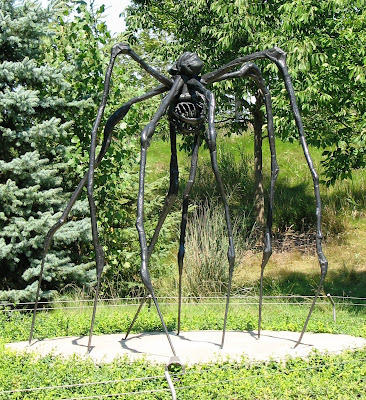 This sculptor of this spider is honoring her mother here based on the strong maternal instincts of the female spider. If you look close you can see the cage-looking structure where she carries and nurtures here young. Boys, do not expect that I would feel honored if you tell someone that I remind you of a spider!! 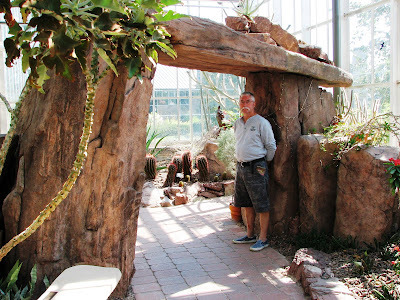 The story is that one day Mr. Meijer asked a youngster where he thought carrots came from..they boy answered, "the Meijers store"...so Mr Meijer decided to include in the gardens a full replica of the farm where his wife grew up. It's a section that is especially used for educational programs for grade school children. 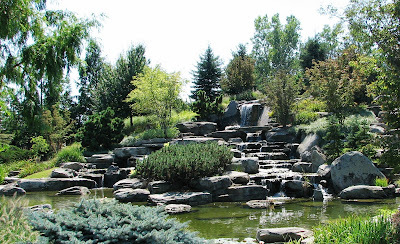 ...and of course the beautiful gardens and waterfalls. It was mid-afternoon by the time we left the gardens. I like to use online forums to find unique things to see and places to eat when we are on the road. One I use frequently is Trip Advisor. It had a place, Marie Catribs, identified by dozens of contributors as one of the top restaurants in Grand Rapids. 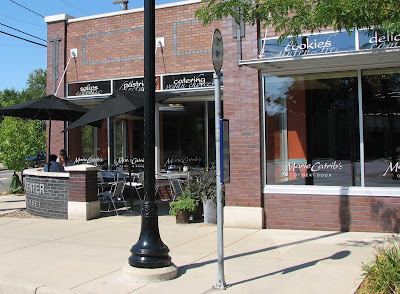 Since it was a deli and was only a few miles from the sculpture gardens we tried it out. The food was awesome. Ken and I each had grilled chicken sandwiches but mine had this really awesome cranberry sauce while Ken's had a cilantro sauce. Both were on these huge soft slices of challah which is a Jewish egg bread. Again, using the Internet, I had noticed there was a place with old houses called Heritage Hill. 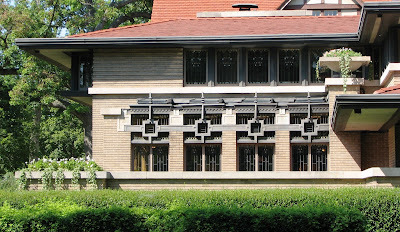 Ken is a real fan of Frank Lloyd Wright architecture and they had two housed there. Here's a few shots of those houses. 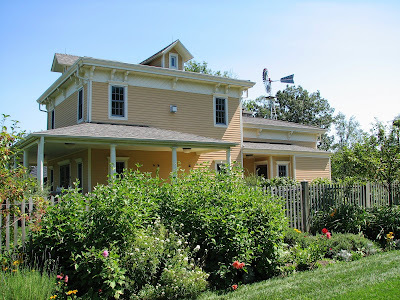 This is the May house, built for the original owners of the large May Department Store chain. 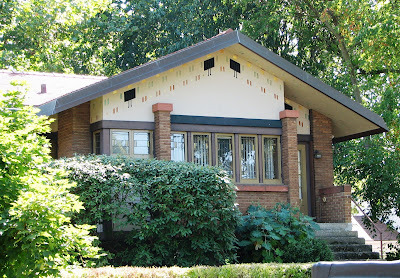 The smaller home down the block was designed by Wright for Mrs. May's parents. Ken is really in to the lines on these houses, I love the unique way they use stain and leaded glass and the stenciling done with various types of stone. On our way back to Cedar Springs, we stopped at a huge Meijer Store to pick up the standard...milk, eggs, etc., along with a sirloin steak to do on the grill for supper. I had never been in a Meijer Store before and this one made our hometown WalMart Superstore look small! 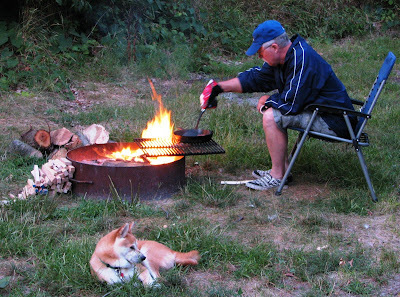 We pulled out the grill when we got back to the RV, had a late dinner and then I hit the sack while Ken, stayed up to watch a bit of the Democratic Convention. As you can see, the state park was a much quieter place on a Tuesday morning, than it was over the weekend. We decided that this site, #22, is the one we'll go for on our next visit. The only time you see sites this big in Illinois is when it's designated a handicap sites. Since they seem to have lots of little bitey bugs in the grass here, I'm expecially fond of the concrete around the firepit. My legs look like I've got measles from all the bites. Ken doesn't have any...hmmm. We spent the morning checking around to decide where to stay next. Between the Internet, our Woodall's guide and our Trailer Life guide, we came up with 4-5 options. 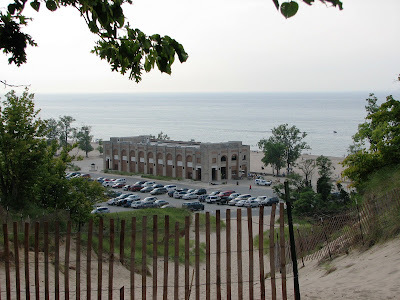 While Holland State Park was on the list, it is really perturbing that they charge not only for the RV site but also for every motorized vehicle, every day. 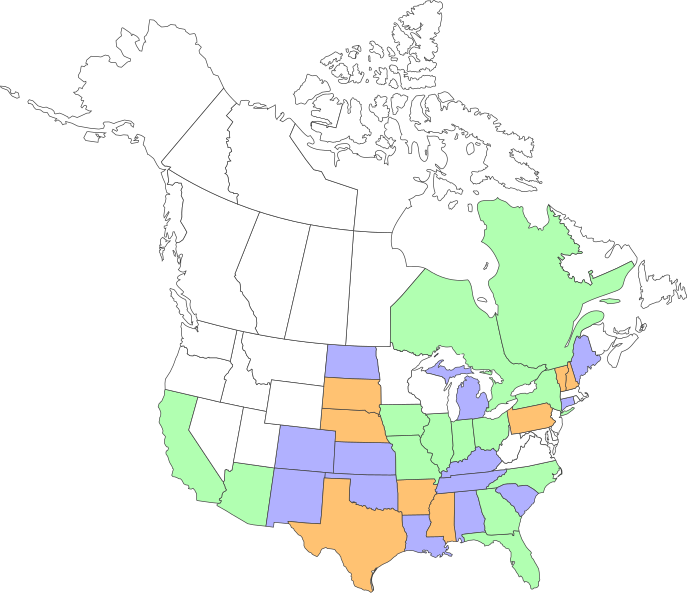 Out-of-state vehicles are more expensive. This means that in a Michigan State Park we end up paying $40+ dollars a day for an electric site. I understand because of all the financial woes in Michigan they have raised rates and at the same time are also shutting down state parks. 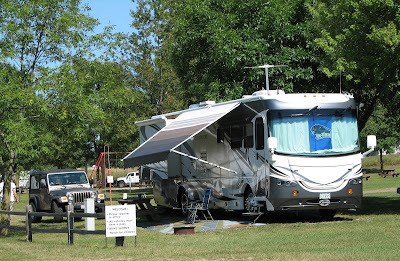 This definitely sounds like a sad downward spiral they've put themselves in, since out-of-staters like us will now opt for private RV parks that are cheaper and have full hookups. 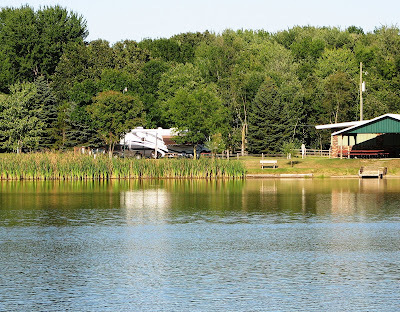 We decided on a highly rated RV Park in Cedar Springs, MI that made this jaunt of the trip less than 140 miles. 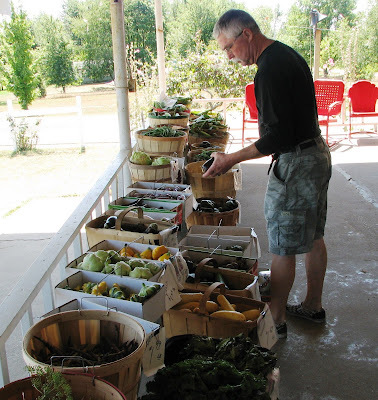 That meant we took our time packing up and hit the road about 10:30.
so we dropped in to re-stock on fresh fruits and vegetables. We sampled several of the really tasty Michigan peaches and decided our favorite was the Starfire variety. These might even rate a little above our Calhoun County peaches back home. A freshly baked cherry pie just happened to jump in the bag as well. We then stopped farther down the highway at a rest area and made lunch and kicked back for a bit...ended up turning a 2 1/2 hour drive into about a 5 hour drive...plus we changed time zones. 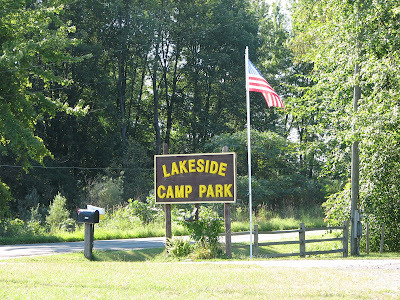 That meant we arrived at the Lakeside Camp Park about 6pm Michigan time. Friendly and accomodating staff. It appears that about 3/4 of the park is made up of permanent residents, however. We were in site #32 which is the most 'on display' site in the park, right at the front gate with no privacy. However, it was the farthest away from the Interstate noise. In retrospect I don't know why I asked for full hookups since for 2-3 nights there is no advantage to that for us. We decided to head in to Cedar Springs and ended up eating at a small restaurant in town. Ken had homemade liver and onions. I had the Fettucini Alfredo, and could only eat about half, it was so large. Nice think about the RV is that this then came home to make a side dish for tomorrow nights meal. We got this shot of the RV from across the lake while taking the dogs for their evening walk. 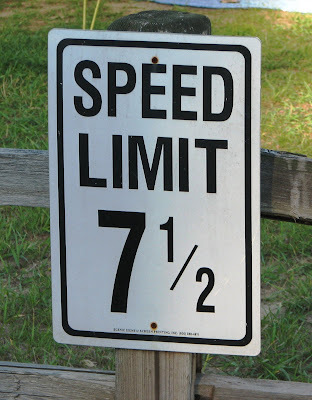 This place definitely takes their in-park speed limits seriously! Day 4, again we took our lazy sweet time getting moving this morning, but after we were up and at'em we decided to visit the Nature Center and take a hike on one of the trails. This is the Nature Center. 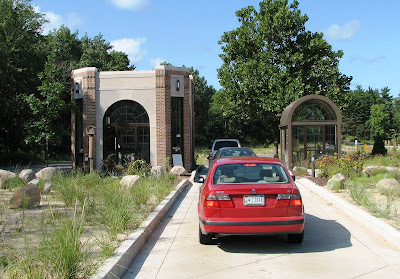 They displayed the animals, bugs, plants, and especially the birds that are found in the Dunes State Park. They had a water area and group of bird feeders set up outside a glass wall where people could watch the numerous birds feed and drink. After leaving the Nature Center Cindy belittled me and beat me with a stick until I agreed to go for a hike on one of the trails. Just kidding, but she did have to do some persuading. We opted for trail 9 as it was the one that gave the most typical landscapes of the area. We strolled through forest areas similar to those in other parts of the midwest except the ground was sandy and gray rather than the typical black/brown of the midwest. We traversed small hills up and down and finally mostly up until the forest gave way to the naked dunes and the beach below. Ditka doing his Rin Tin Tin impersonation. For those too young, Rin Tin Tin was a hero dog on TV back before there was color TV. This picture was taken just before the dogs pulled me down the sand dune to the beach. 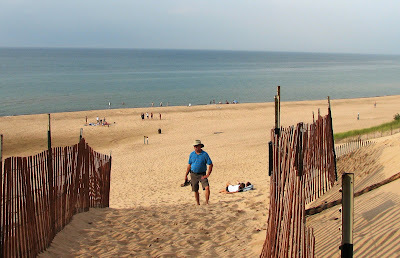 Rather than continue on the trail we decided that the beach was more inviting than climbing up another dune. 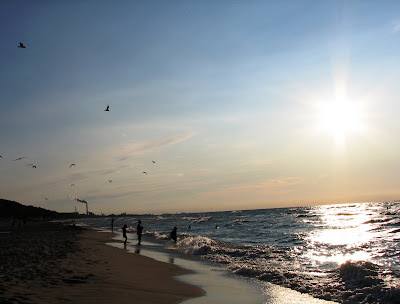 After returning to the RV for dinner and a little rest we returned to the beach for the sunset. 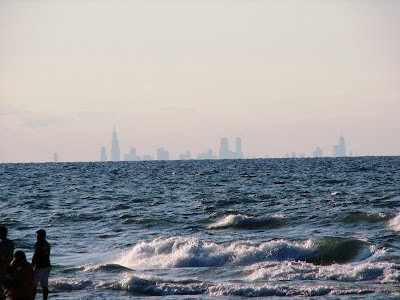 Chicago skyline, 40 miles away. Pretty, windblown Cindy at sunset! After taking our time with a big breakfast, we decided to drive around the area and check out the National Park. 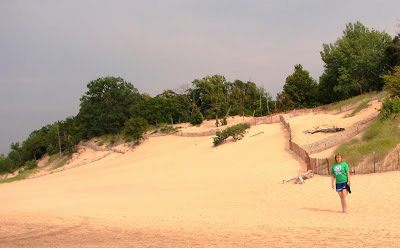 Indiana Dunes State Park is surrounded by the Indiana Dunes National Lakeshore. 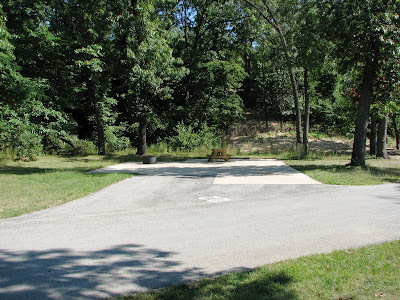 This is definitely a case where the state park campground is many, many times better than the national park campground. We drove through the national park campground and it was primitive sites only. No electricity, no water, and the sites were very small. Many sites were blocked off so only tents could use them. We did see three or four very small travel trailers and a van or two but mostly tents and there weren’t many of those. Meanwhile, the state park the camp ground was full. It has 140 sites, many with 50 amp service, and has a lot of sites that will accommodate big rigs. We finally found one of the places we were looking for. We found the Chellburg Farm. There is a sign that points you down a road that ends at a shelter house and parking lot. We parked and began looking around and found an unmarked trail that led to an empty building. 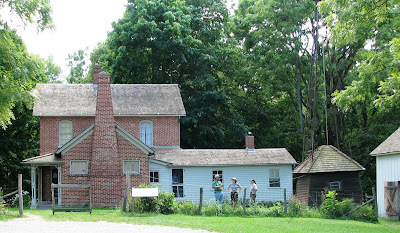 On our way back to the jeep we met another group looking for the Chellburg Farm. After some discussion we decided that it had to be there somewhere. I happened to find another trail and it had a sign the size of a recipe card with an arrow pointing to our right and the words Chellburg Farm. Can you believe it? It was worth searching out. 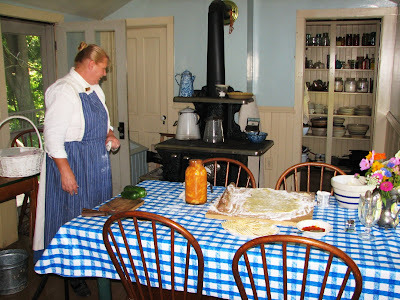 There were two ladies in the house to show us around and explain how things were done around the turn of the century. For those readers that are relation, the house reminded me very much of uncle Fred and John’s house when we visited as kids. It had the same wood burning aroma, similar screen doors that slapped shut, and wooden floors that felt the same as their's to walk on. We spent a lot of time in the kitchen talking with one of the ladies about the kitchen, the surrounding area and using water from the cistern. They caught the rain water from the roof of the house and stored it in the cistern for later use. But unlike the house that I grew up in where we had diverters on the downspouts, they let ALL the rain water into the cistern. Therefore, there at times they had water that was funny colored or tasted bad. Diverters on the downspouts allowed you to divert the initial rain water away from the cistern. That water was usually dirt because it was washing all the dirt off the roof. After it rained awhile and the roof was washed clean by the rain we would switch the diverters to guide the clean water into the cistern. That way we had clean water in our cistern. 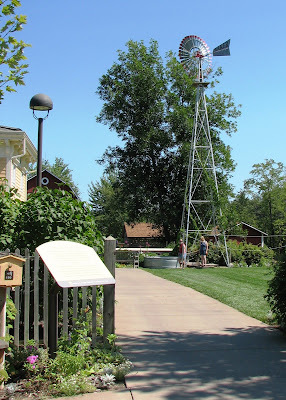 Once outside we were looking at the windmill and pump house when some of the workers came up to look at the pump. It was operational until just a few days prior when one of the parts gave way. We were welcomed into their discussion when I asked a question or two about the pump. As we moved on to the barn and horse area we continued to discuss things with this gentleman. He very informative and knew a lot about the farm and it’s operation. He was telling us about the horses when two of the park rangers went to get the horses to begin their daily chores. 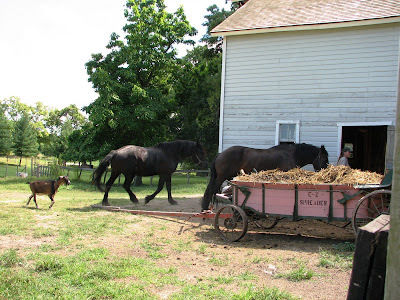 Our conversation ended when he went to help with the horses when one of them decided it did not want to go to the barn. 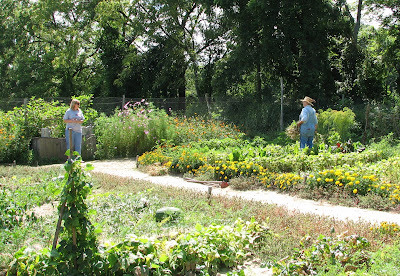 They had a great garden where Cindy and the gardener struck up a conversation about the purpose of the various flowers in the garden. 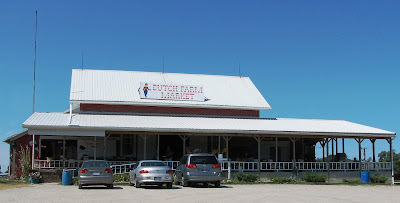 We had spent so much time driving around trying to find this place that by the time we left we were extremely hungry. While on our way back to the campground we accidentally found the new visitor center. We stopped in for a quick look around and for direction to a restaurant. They were not allowed to make recommendations but they could tell us where several restaurants were located. After eating a late lunch, we headed back to the RV for a little rest. Despite the fact that riptides had closed the beach for swimming there was still a line to get back in to the park. Since it was cloudy yesterday we wanted to go back to the beach again today to get better pictures and to take the dogs. On Saturday it was so cloudy and hazy that you could not see Chicago but despite Sunday was clear enough to see the 40 mile distance across the lake. By the time we did that, it was time to start thinking about dinner. So I built a fire to cook hamburgers on and to sit by after we ate. It was a beautiful day only touching 80 and getting cool after the sun had set. Saturday morning we took our time as our drive today was not going to be real long. I talked to the lady next to us and they had been at Tin Cup for several months as they were working in the area. As we were walking the dogs we met the couple on the other side of us. They were on there way home from a trip to Alaska. They had left Ohio on June 4th and traveled to Alaska and were only one day from home. Nice couple-great adventure! 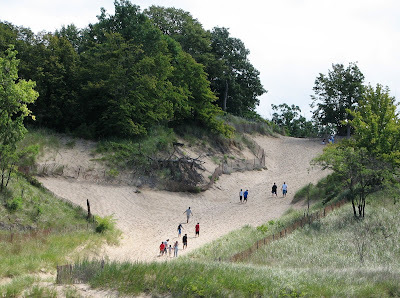 We left Tin Cup mid to late morning for Indiana Dunes State Park. We traveled north on I57 then crossed to I65 on US24. We did this to avoid the Chicago traffic and more particularly the toll roads which really get expensive when you have 4 axles. Everything was fine and going to plan when we started seeing signs about road closures at the intersection of I65 and I94, right where we were headed! While getting fuel at a Flying J we asked about the construction and got a lot of different suggestions from the drivers that were standing there and from the people behind the counter. Apparently there was construction and road closures on some of the side roads too! After sorting through the suggestions and checking Google and maps we found our way to the park without too much trouble. After, we set up in site 18, I needed a break. While Cindy read, I napped for a bit. 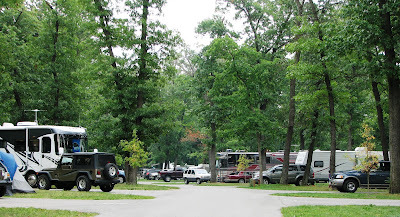 Although the campground was full the sites we large so it did not seem that crowded. 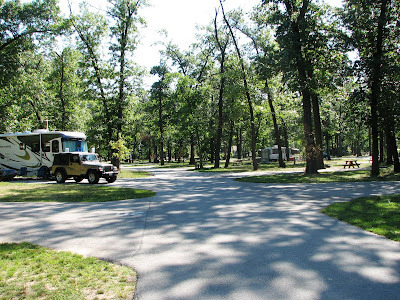 Compared to most state parks this campground seemed to have lots of large family groups. After my rest we walked to the beach. There is a trail at the end of our camp road that leads to the beach. 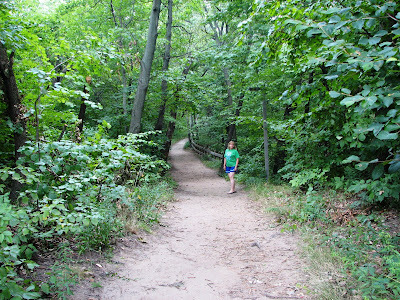 The trail is wide and easy walking, it is about ½ mile long. On the way back we just had to climb over one of the dunes. After several rest stops I made it to the top and had a wonderful view of the beach pavilion and lake beyond. After struggling to get to the top in ankle deep sand, I have you know that I had absolutely no problems going down the other side! This is what it looks like from the beach pavilion looking up. This is called 'Devil's Slide'. It was fun to watch the little one's squeal and laugh as they rolled and tumbled down through the soft powdery sand. 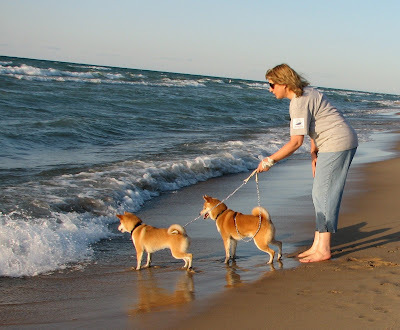 When we got back to the RV, we needed to take the dogs for a walk. So we decided to be the typical nosey campers and checkout the other campers. There are actually two loops to the campground. For some reason it seemed that in our loop we were the minority with many large Hispanic families, mostly in tents. In the other loop there were more RV's. We liked our side since the walk to the beach was closer. Before we got back to the RV it started to rain. It was a light and short lived rain, but enough to quiet the campground. Cindy called to check in on the boys, then we did some pork chops on the grill and called it a night. With the temperatures so cool and the breeze from the lake, we find it really comfortable sleeping with the windows open.